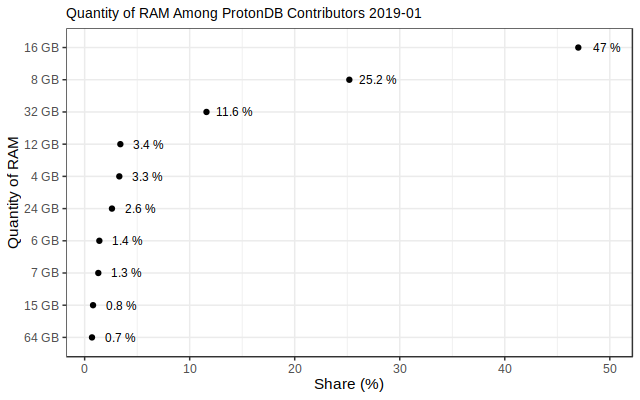 There was a new data dump available a couple of hours ago from ProtonDB, so here’s a quick overview of what we can learn from contributors, this time for January 2019. There were less unique contributors in January, with 1439 individuals for a total of 3189 reports (less than December). The volume of reports is going down a little bit over time, and it is seen in the graph below both in daily counts (black dots) and in the weekly moving average (7 days) in red. 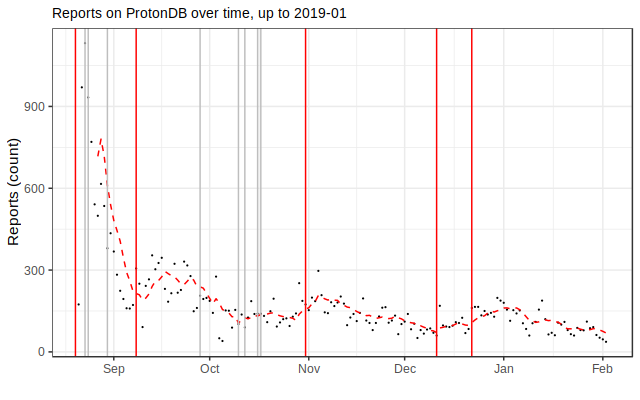 It’s not continuously going down for a simple reason: every time a new Proton version comes around, it rebounds a little before going down again. Which is expected: a new Proton version will make people try things again and report progress or regressions. The below graph shows the actual release dates of Proton versions (red=major, grey=minor). 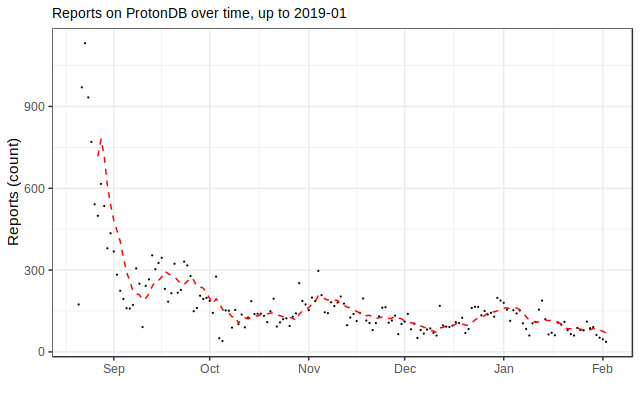 Based on the frequency of previous versions I would say we are due to get a new major Proton version sometimes soon (within February would be my guess). Distro-wise, the graph is almost identical to the previous month’s. Ubuntu-derivatives represent distros used by most reporters, followed by Arch and its derivatives. Nothing really new at this stage. RAM quantity is pretty much in the same range as last month too. Not sure if this should be considered a change or simply variation yet, but when it comes to GPU cards we have about 3% more of AMD GPUs compared to last month. 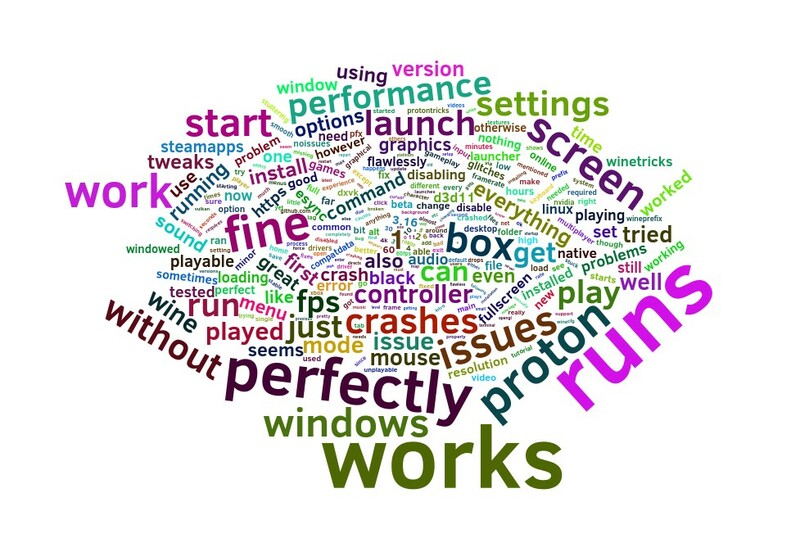 Potential explanation: some folks got a new GPU for Christmas and it shows in the stats. 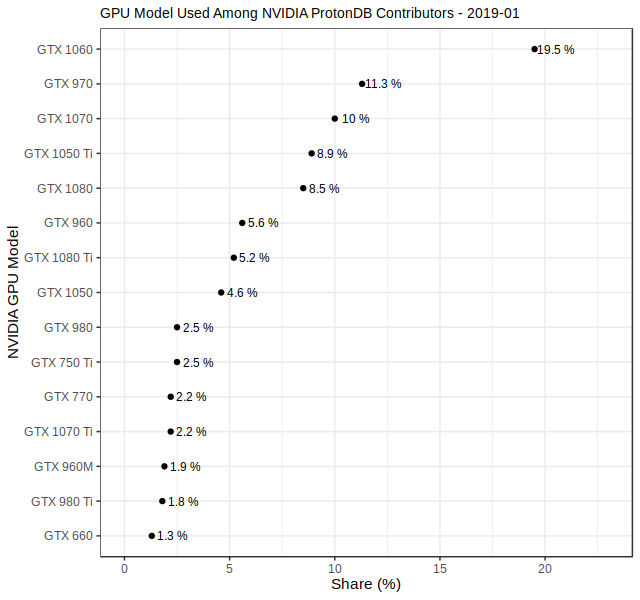 Other one, just as good: 3% of Nvidia users were busy in January and did not report anything on ProtonDB during that time. I should actually be able to provide some elements of answer but I lack time right now. On the Nvidia GPU part of the spectrum, no major change but I am actually surprised that there’s hardly any 2070 or 2080 in that list. It’s been a while already and I would have expected them to show up somewhere. 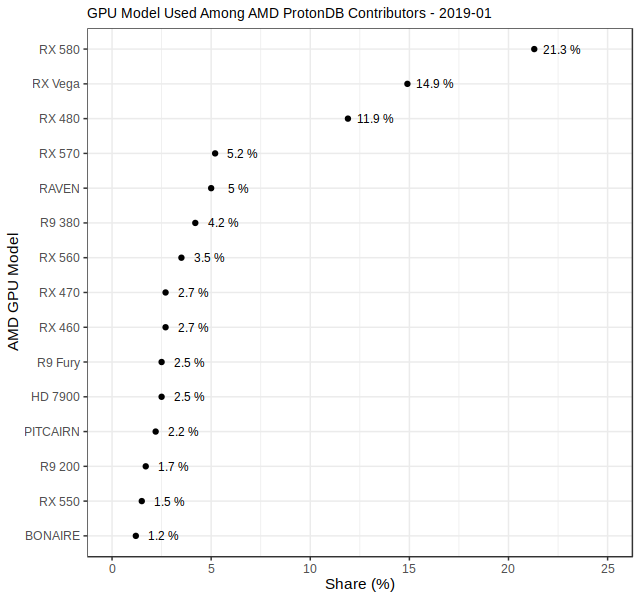 Among AMD GPU users, the percentages fluctuate a little versus last month but the ranking is consistent. We’ll see if the new GPU release in March 2019 leads to some changes later in 2019. The most interesting one is Paladins, getting a large share of interest apparently, because it’s a free-to-play game that’s multiplayer and very well received. 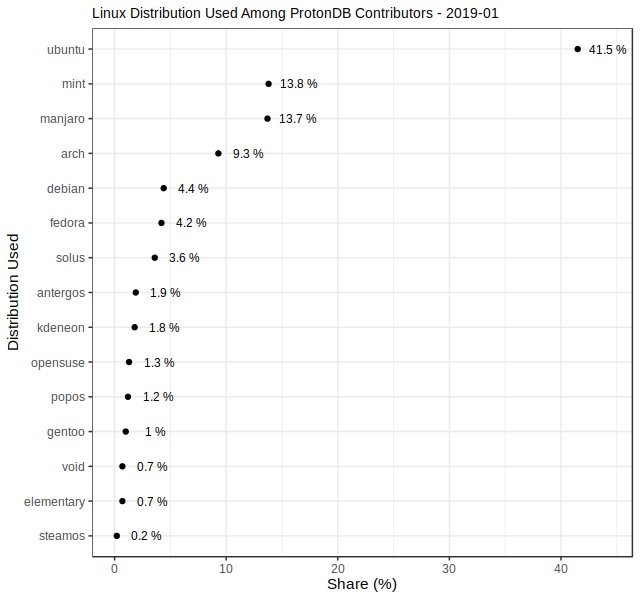 Note that Paladins runs more or less out of the box (depending on people) according to the ProtonDB reports. That’s all for today. There’s more analysis to come in a few days so you better stay tuned! (Register to follow us on Mastodon if you haven’t done so yet).